For the first time, scientists showed that personal vaccines targeting existing cancer tumors are feasible and safe in humans, via two separate, small clinical studies published Wednesday in Nature (here and here). In fact, both studies reported that around 60% of their patients with advanced-stage melanoma were tumor-free for 12 to 32 months after receiving their personalized vaccine regimen. And, all of the patients showed some level of T-cell immune response — usually a strong level — after the vaccinations, meaning that, at the very least, the shots appear to jumpstart the immune system. "Finally. The war against cancer really started 40 years ago but we have just started being smarter" on tackling it, Siwen Hu-Lieskovan, UCLA oncologist who was not part of these studies, told Axios. "Instead of trying to burn, poison or cut [the cancer] out, we've become smarter. We can utilize the patient's own immune system as a weapon against cancer." Yes, but: These studies are both very small (one vaccinated 6 people, the other 13), which means it is "not overwhelming evidence," Hu-Lieskovan said. Other serious limitations include the overall cost and the long lag time between biopsying the tumor and sequencing the mutations to developing the vaccines (ranging from 3 to 5 months, although the process now is more automated, reducing the needed time). 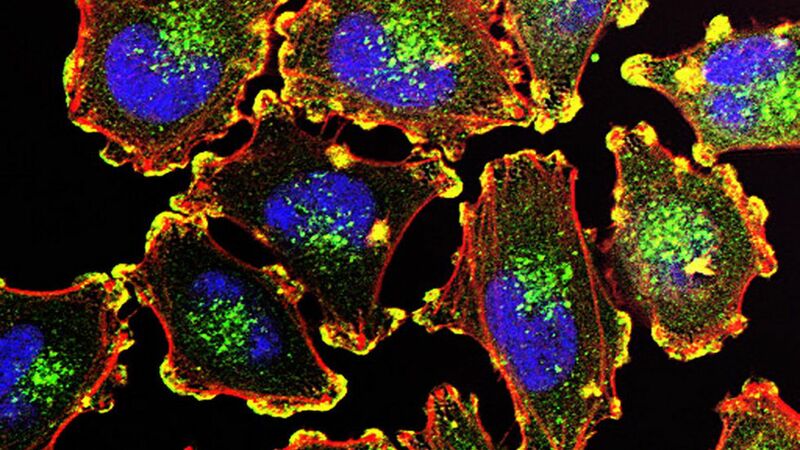 Selected melanoma patients with high risk of recurrence, because this cancer is known to usually respond to immunotherapy (so if the scientists can't get a response from melanoma, they know it would very difficult to get it from other cancers). Decided to target the neoantigen proteins on the cell surface that are produced by DNA mutations. Neoantigens are present in cancer cells but not in normal cells, making them an ideal tumor-specific target for immune therapy. Showed negligible side effects from the vaccines. Post vaccination results included: a lower-than-expected level of tumor recurrence, a significantly lower rate of metastasis, and showed that the addition of other immunotherapy treatments (like anti-PD-1) is usually very effective for those cases where there was tumor growth. While the studies show many similarities, they used different steps to reach their conclusion. U.S. vaccine study details: The scientists selected 10 people for their study, and determined 6 were eligible for the vaccine. The team operated and removed the patients' tumors, sequenced tumor and normal cells, selected up to 20 mutations/person, and made the peptides to put into the vaccine. The vaccines, which were started an average of 18 weeks after the surgery, were injected subcutaneously into four sites, five times over three weeks plus two booster shots later. Out of the 6 who received the vaccine, 4 showed no evidence of cancer recurrence. The other 2 patients showed cancer had spread to the lungs, and they received an additional treatment of a PD-1 inhibitor, later showing a complete resolution of their tumors. "We found strong immune response in all 6 patients that were vaccinated," Dana Farber's Patrick Ott, a study author, told Axios. "What the vaccine can do is to steer the immune response specifically to the cancer." E.U. vaccine study details: This team selected 13 people, took samples of tumor and blood cells, sequenced everything, selected up to 10 different mutated neoantigens per person and engineered it into synthetic RNAs, which were injected into the lymph nodes for up to 20 doses per patient. Out of the 13 who received the vaccine, 8 remained free of tumors and the remaining 5 had tumor relapses. Out of the remaining, two died, one had complete regression of tumors after being given a PD-1 inhibitor, and one had a mutation that did not allow the the vaccine to work. Ugur Sahin, study author and CEO of BioNTech, said, "Although the study was not designed to see clinical efficacy, we found early evidence for the anti-tumoral activity of the vaccine." Further study needed: "The two studies confirm the potential of this type of approach, and improvements in neoantigen prediction will probably allow the even more efficient and precise identification of neoantigens for use in therapeutic vaccines in the future. Although the numbers of people who were treated in these studies were small, both studies indicated potential benefits," cancer immunologist Cornelis Melief wrote in his Nature commentary on the studies. Melief said controlled, randomized phase II clinical trials with more participants are needed to establish the efficacy of these vaccines in patients with any type of cancer that have neoantigen targets.